Are you ready to Rock? Nostalgia just got heavy! We’re transporting you back to the decades when Rock ruled the airwaves and spandex, big hair and power chords was the norm. 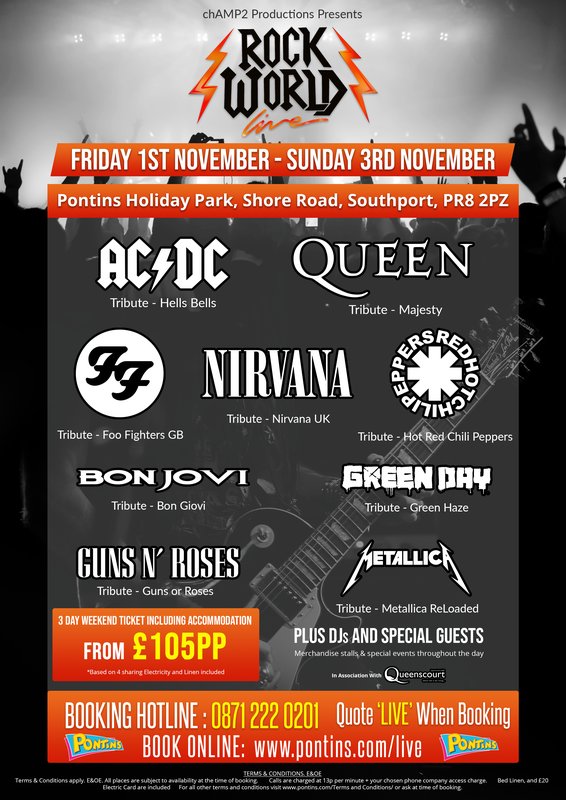 Featuring the UK’s top tribute acts, Rock Out to 3 nights of live performances of all of the classics from Queen (Majesty), ACDC (Hell’s Bells), Green Day (Green Haze), Nirvana (Nirvana UK), Bon Jovi (Bon Giovi), Guns ‘n Roses (Guns or Roses), Metallica (Metallica ReLoaded), Foo Fighters (Foo Fighters GB), Red Hot Chili Peppers (Hot Red Chili Peppers) and featuring some of the UKs top Rock DJs to play classic rock until the wee small hours! With special guests, new talent and up and coming support acts, this weekend will be one not for the faint hearted! Bu it doesn’t stop there, to make this a weekend to remember, there will be plenty of fun activities taking place throughout the day, all included in the price. We’ve also invited select exhibitors and vendors for you to browse at your leisure. So what are you waiting for? Relive the greatest era of Rock. Book your weekend ticket including accommodation and get ready to Rock! To book, simply click on the prices within the table below! All Prices below are based on a self catered apartment.